Over 200 rodkohis (seasonal hill torrents) come out of this mineral rich Suleman Range, and if properly managed, could irrigate more than two hundred thousand acres of agricultural land, most of the Pachaddh area, but the scheme for flood distribution, canalization and construction of spill ways is yet to be approved. The water of these torrents causes colossal damage to life, crops and property in every monsoon season and flows unutilized. Lined up with Pillu trees, Dajil-Harand Road is broken-down and boulder like stones are spread around. It takes painfully long to cover the distance of just 25 kilometres. Ex-President Farooq Ahmed Khan Laghari who has his roots in the area, during his tenure managed electricity and telephone in the area but could not get the roads built that are necessary for the development of this historic belt. History has it that Harand Fort was originally built by Hindu Raja Harnakish in the name of his son Hari Nand. The fort had seen three different periods: Hindu, Macedonian and Muslim. The third period of this historical monument starts with the arrival of Muslims in the area in early eighth century. The palm trees found in the region are indicated as an evidence of the arrival of Arabs’ Army. Subsequently, all the adventurers who came this way - from Changez Khan to Muhammad Chori - visited the fort and used it for their convenience, contemplating their next moves. During Sikh rule, the fort was rebuilt on the present location for strategic reasons. This fort garrisoned the Sikh army to control the Baloch tribes. Later, the famous battle between British troops and Marri-Bugti tribes was fought here in 1867. After annexation of South Asia, the British used the fort as a cantonment. The British carried out limited excavation and historic artefacts recovered from the site were sent to British Museum in London. Presently, there is a small Lewis post in the fort. All said and done, off the beaten track, ruins of Harand Fort still continue to mystify those who take their chance to go there. First of all it gives an emotional look, as a symbol of our evolution and continuity. No matter what your pursuits and interests, you will fancy finding out so many things about the important monument of the past. And, every time you leave Harand and look back to watch the fort receding in the distance, your mind is flooded with thoughts of its architects and inmates over a long period of time as it stands there lonely and mysteriously on the Suleman mountain, its importance lost in the hazy vistas of time. As I drove back on a pebbled road, plied mainly by animal transports and occasional automobiles, I could not help thinking: Can the plight of the priceless site be brought to the echelons of power? Can some national or international agency be moved to act and save the place for coming generations before disappears totally? The remains of the monument have to be preserved and saved from total ruination, a danger they are facing at present. 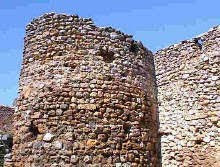 Could it be one of a group of UNESCO world heritage sites: Fortress Forts of the Pakistani border? Just 2/3 miles from me is the Hadrian's Wall World Heritage Site. Across the sub continent from you is the Darjeeling Railway which is also a WHS.